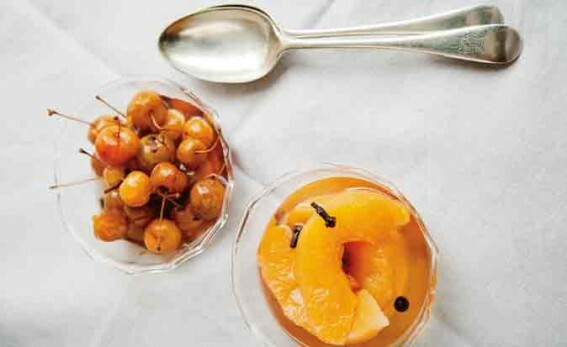 I adore pickled fruits as I have a real penchant for sweet and tart flavours together. They work perfectly with cold meats, patés, terrines and cheeses. You can also serve them with hot dishes, such as roast pork or duck, baked ham or game. They’re mostly made using the same technique – the fruit is poached in sweet vinegar solution, then bottled – but the vinegar-to-sugar ratio changes depending on the sweetness of the fruit, and the spices can be varied. You can make pickled pears in the same way, but cook them for a shorter time, just until tender. Put all the ingredients, except the quinces, in a large saucepan and bring to a boil. Reduce to a simmer and stir a little until all the sugar has dissolved. Set aside. Peel and halve the quinces. Remove the cores with a small sharp knife. Cut each quince half in four lengthways. Heat the vinegar solution again and add the fruit. Cover and simmer until tender, it should take about 20 minutes but may take longer (quinces are rock hard). Transfer the quinces to a warm sterilized jar with a slotted spoon. Boil the vinegar until reduced to about 450ml (16fl oz). Strain it through a nylon sieve over the quinces while everything is hot. Add the spices from your sieve, but discard the zest. Seal with a vinegar-proof lid and keep for one year. Make as above using 1kg (2lb 4oz) crabapples and change the spices: use 1 cinnamon stick, 25g (spare 1oz) peeled fresh root ginger, sliced, and 2 tsp allspice berries, bruised, plus 750ml (1 ¼ pints) cider vinegar and 800g (1lb 12oz) granulated sugar (this has to be sweeter because the apples are tart). Wash the crabapples, prick each with a skewer and simmer for three minutes, until tender. Transfer with a slotted spoon to a warm sterilized jar, then finish as above. Fills 1 x 1 litre (1 ¾ pint) jar. Make as above, but using 750g (1lb 10oz) granulated sugar and 450ml (16fl oz) vinegar, 1 tsp allspice berries, 6 cloves, 2cm (¾in) fresh root ginger, sliced, and 2 cinnamon sticks. Stone 1.5kg (3lb 5oz) under-ripe peaches and cut into wedges. Add to the syrup and cook until tender. Put into a warm, sterilized jar, then finish as above. These are better after a few weeks. Fills 1 x 1.5 litre (2 ¾ pint) jar.